Happy Thanksgiving to all of you! Personally I am thankful for my health, family, and safety, my thumbs, and living in a country where I can soon apply to become an American citizen. That said, my girlfriend told me that an unspoken requirement for citizenship is to watch the Macy’s Day parade. As such, I am doing so, I really enjoyed the Rick Roll, which if you missed is on the internet here. 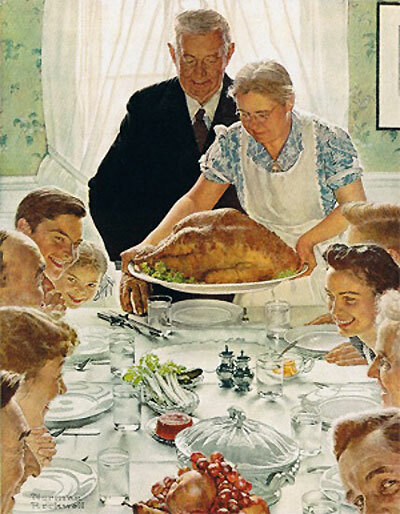 To keep things on a comic level, although it is a very personal day for many people, I’ve noticed that many comic blogs are taking today as an opportunity to compare DC’s version of Rockwell’s thanksgiving to the original. While apparently I am doing the same, I would like to add an extra, a Macy’s Parade spiderman. Not everyone is posting short updates today. 4thletter added an unbelievably long talk into… I don’t even know what, it took me 2-4 different sittings to read the whole thing. It went from Venom to Mace (yes, that’s right, Mace), and back to venom with some spiderman clone action. Know what? Read it for yourself, it’s pretty good, just long. With that, check back later today for my top six Marvel titles of 2008 to be thankful for this Thanksgiving.